The following is overview of the structural reform of the Family Law Courts in Australia. The fact sheet has been prepared by the Australian Government Attorney-General’s Department. results in poor outcomes for some children and families. The reforms will address these inefficiencies. courts; and drive faster, cheaper and more consistent resolution of disputes for Australian families. and Division 2 will comprise the existing judges of the FCC. current Fair Work Division of the FCC will be retained in Division 2 of the FCFCA. Australia, or other state and territory courts that deal with family law cases. relevant judge and division with the right expertise and capacity. and consistent handling of family law matters. implications of lodging a family law application upfront. summary jurisdiction. This appellate jurisdiction will be extended to both divisions of the FCFCA. 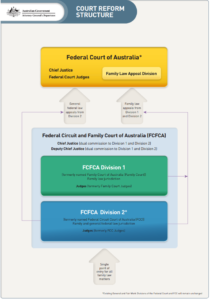 provided for under the Family Law Act 1975.
legislation, the FCFCA and the FLAD will commence operation on 1 January 2019.
a view to achieving consistency in forms, procedures, administrative matters and practice directions. effectively and efficiently as possible, and with the minimum of inconvenience and delay. For comment or media enquiries by Claire Naidu & Co, click here.